I’m here today to talk with Hazama-san, a producer at Square Enix, about his latest project, THEATRHYTHM FINAL FANTASY. Pleased to meet you. Thanks. I’d like to begin by talking about your experience in video games so far. We’ll get on to the game itself eventually, but I often find that the experiences and thought processes of the creator of a product are reflected in the product itself. What was your first experience of video games? If you mean playing them, I remember that my friends and I used to go to the arcade a lot on the way home from high school. Before that, I played console games from junior high school age onwards, but I didn’t have a console of my own, so that was always at friends’ houses. I was obsessed with Mario Bros.1. I would just keep playing and playing until the mother of whichever friend it was would come and say, “Don’t you think your parents will be worried about you?” Then I would just grab the cartridge and move on to the next friend’s house... 1 Mario Bros. was an action game released on NES and in the arcades by Nintendo in Japan in 1983. It was always a real scramble for the controller in those days, wasn’t it? Yes! (laughs) I think it was the same in houses everywhere. Yes, I think that’s one of my earliest memories of video games. Is there anything in particular that has stuck with you from those early experiences? I suppose that as a child I always saw games as something that had to be enjoyed with friends. I never thought of them any other way. It was probably because, like I said before, we never had a console at home. Were you not allowed one? I think that was it, yes... It’s the first time I’ve ever had to talk about myself like this! (laughs) Nowadays, I get along with my parents very well, but back then, they were pretty strict. I suppose that was why, when I first moved out of home, I spent all the money I earned on doing the things I had never been allowed to do before. It seems so silly now... It was just little things like having bubble baths like the ones I’d seen in the movies, that sort of thing. (laughs) I mean, the best I could expect at our house from my parents was that the bath salts allegedly included the same ingredients as those of famous hot springs, you know? What else...? Oh, watching TV in the bath, that sort of thing. I sound rather obsessed with baths! (laughs) Anyway, yeah, it was mostly that sort of thing. I suppose you were just enjoying the feeling of having nobody to tell you what to do. Exactly. So it wasn’t long before I ended up buying my first console. I bought myself a SNES, and a copy of Final Fantasy VI2. 2 Final Fantasy VI was the sixth instalment in the Final Fantasy series, and was released by Squaresoft (now Square Enix) for the SNES in Japan in 1994. So that was your first encounter with Final Fantasy? Yes. I took it home, plugged it into the TV, popped in the cartridge, and grabbed up the controller thinking, “Let’s do this!” Then I saw that opening sequence... That was a really pivotal moment for me. It was so much more impressive than what had come before, wasn’t it? Yes. It was amazing. The credits appearing while those Magitek Armor suits walked through the snow like something out of a movie... It was the first time I’d really sat down with a game like that, and it was the first one I’d ever bought. I was instantly hooked. So that was the moment that video games captured your heart, was it? Yes. I was working for Bandai (now Namco Bandai) in the games section at the time, but I was in procurement, so I never imagined I would one day be working for the company that made the game I was playing. That’s not a department that has any relationship with development teams, is it? It’s difficult without an “in” of some kind though, isn’t it? Some people are especially good at drawing, or good at programming, and get their start from there, don’t they? From that perspective I think - although my title today is a producer and I love games - I am not a creator. But I did start feeling very strongly around that time that I wanted to be involved somehow, even if I wasn’t creating games myself. I see. And I suppose, even if you’re not involved in production, even if you’re in procurement or whatever, you still have to know your product extremely well, so that you know how many copies to order and things like that. You have to know how certain products have been received, otherwise you might make a mistake, and leave the company with a mountain of surplus stock. And I suppose while doing that, you naturally start thinking, “If only this game had been designed differently, like this,” or, “People really respond to this.” That kind of thing? Yes. There was plenty of that. Without that, I suppose you wouldn’t be able to look at your products the right way. And without such a list in your mind, even when you do end up on the development side, you cannot propose these ideas easily. Well, no. If I look back, I’d say absolutely not. But it’s still interesting - when I have conversations like this, it makes me realise that there’s no such thing as wasted experience. Everything has its use further down the line. I often think that, even if something isn’t particularly enjoyable at the time, it will eventually serve me well. So was that the reason you ended up at Squaresoft (now Square Enix)? It was certainly part of it. I’d been in charge of procurement at Bandai for five years, and (Shinji) Hashimoto3, who is now a corporate officer of the company, invited me to join. 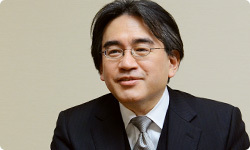 Actually, you could say, he tricked me into joining... (laughs) 3 Shinji Hashimoto is the Corporate Executive of the 1st Production Department. 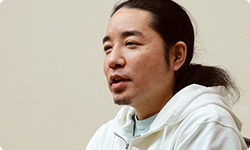 He began as a producer at the original Squaresoft, where he oversaw many titles, including Final Fantasy VII. (laughs) “You! Make us some great merchandise!” That kind of thing? But you were in game procurement at Bandai, weren’t you? You didn’t have any experience of making merchandising products. No. But that meant it was all new experience for me. I didn’t mind at all, and I got to help out with lots of other things while I was doing it. 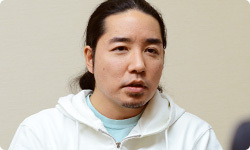 And then, one day, (Tetsuya) Nomura4 and I were having a chat, and he mentioned that almost everyone who joined the company, no matter what department they ended up in, loved games and had wanted to make them at some point, and I remembered, “Oh, yeah. That used to be me, too…” 4 Tetsuya Nomura created many of the most beloved Final Fantasy characters as a character designer, while as a director, he is responsible for the Kingdom Hearts series of games. And after hearing Nomura-san’s comment, suddenly what had been a vague idea became a concrete desire? Exactly. Suddenly it all clicked into place, and I realised I was in just the right place to realise my dream.